The demonstration lasted 17 minutes, in honor of the 17 killed at Marjory Stoneman Douglas High School on Valentine’s Day. 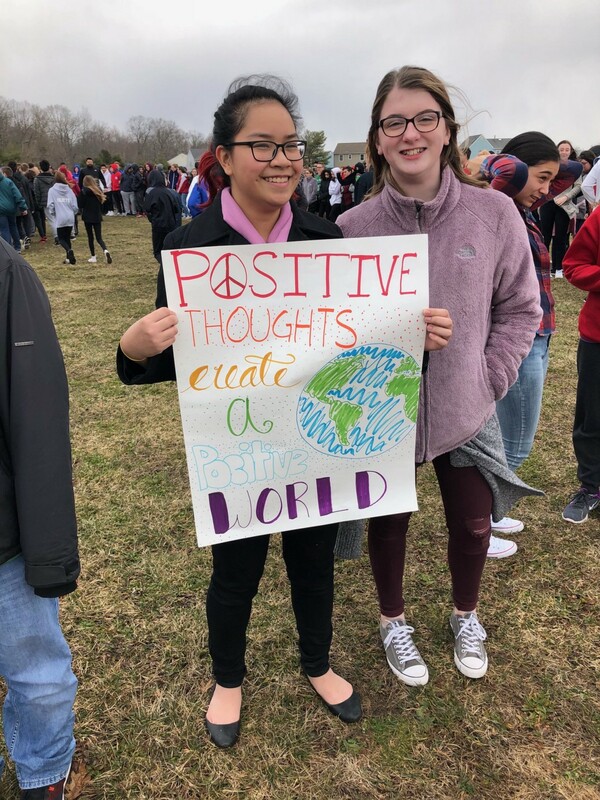 Bunker Hill Middle School eighth grade students Katrina Lucero (left) and Maeve Fitzgerald shared their sign “Positive thoughts create a positive world” during the school’s assembly. Photo: Jan Giel, special to The Sun. Washington Township School District administrators and the Washington Township Police Department coordinated their efforts in support of planned student demonstrations at Washington Township High School, and the District’s three middle schools on March 14, as part of the National School Walkout. Washington Township students joined students across the country in a call to Congress to move school safety to the forefront of the nation’s conversation. The demonstration lasted 17 minutes, in honor of the 17 students and staff members killed at Marjory Stoneman Douglas High School in Parkland, Florida, on Valentine’s Day. At 9:56 a.m., WTHS student council representatives, including senior Christina Fath, junior Ivellise Morales, junior Jessica Hatch, senior Deven Patel and senior Janel Weeks, addressed their classmates over the school’s public address system as classmates who chose to protest exited the building and gathered outside, linking arms. Washington Township police closed the campus to visitors during the event. 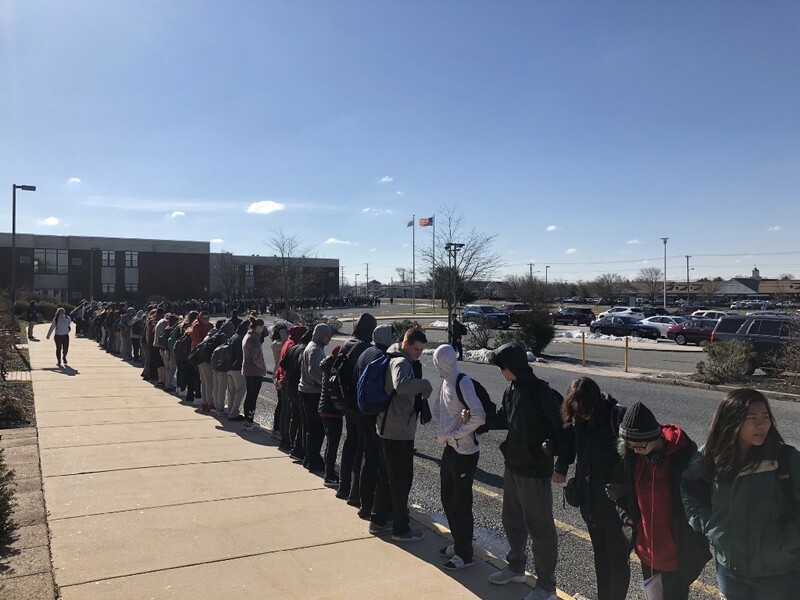 Washington Township High School students all linked arms in a show of solidarity during the observance of National School Walkout on March 14. The line of students stretched the length of the school’s campus. Photo: Jan Giel, special to The Sun. Morales reiterated WTHS’s new safety mantra. Hatch read out the names of all 17 victims of the Parkland shooting. Patel called for a moment of silence in their honor for all those who have suffered violence in school shootings. Weeks concluded the protest by urging her classmates to look around and make a change. District middle school students also assembled and discussed the importance of the day. Bunker Hill Middle School students followed their assembly by forming a human peace sign outside of their school. 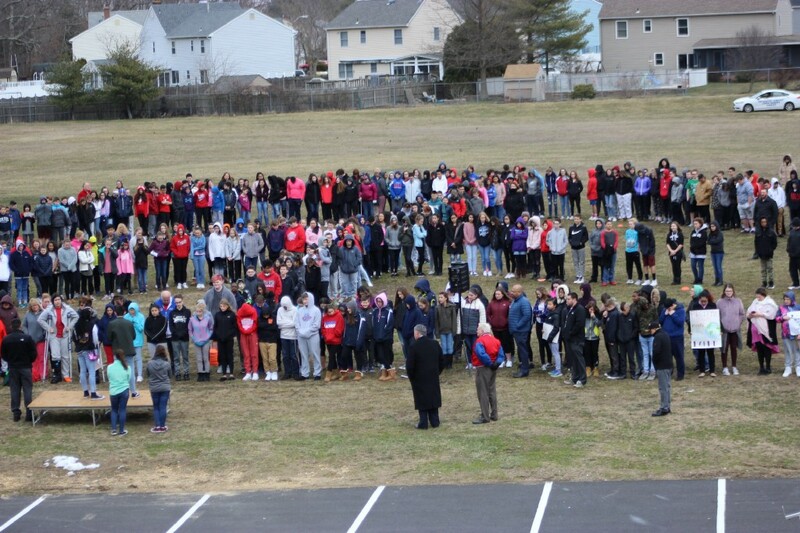 Bunker Hill Middle School students assembled in peace sign as Superintendent of Schools Joe Bollendorf and Board of Education Vice President Bob Abbott look on. Photo: Jan Giel, special to The Sun. “I couldn’t be prouder of the message of caring our student leadership shared with their fellow students today,” Superintendent of Schools Joe Bollendorf said. “The message of ‘See Something. Hear Something. Say Something’ is the most empowering piece of information they can share and adopt. Today was a demonstration of unity, as our students let their voices be heard in the belief that they can make a profound difference in our schools.